In short, it's spaghetti plus a hamburger. A spaghetti burger. What could go wrong? 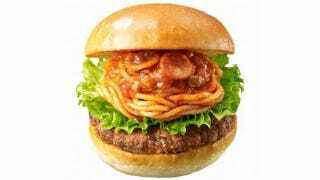 While this certainly isn't the first spaghetti burger, this is one of the first to be offered by a major fast food chain—in Japan, at least. Dubbed the Neapolitan Burger, the meal was created by famous Japanese chef Tatsuya Kawagoe. Served on two buns, the Neapolitan Burger is made with finely ground meat and pasta with, well, Neapolitan sauce and a piece of lettuce. According to NariNari, the burger goes on sale for a limited time later next month in Japan for 420 yen ($4).